NEW ORLEANS – While the top men’s program might have remained in place, there’s a new No. 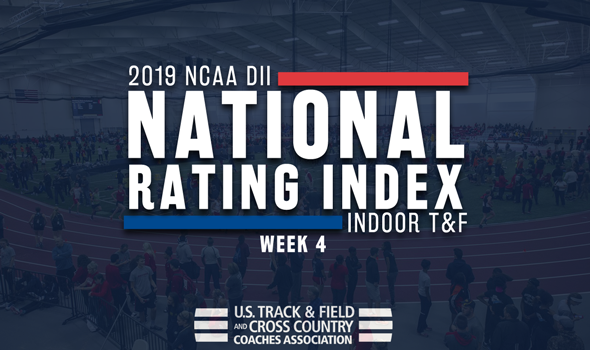 1 on the women’s side of things in the latest edition of the NCAA Division II Indoor Track & Field National Rating Index released by the U.S. Cross Country and Track & FIeld Coaches Association (USTFCCCA) on Tuesday. Both the Adams State men and women now lead the country as the men’s team held pat in the top spot while the women’s program moved into the No. 1 position for the first time this year. Remember to keep checking in as the 2019 NCAA Division II Indoor Track & Field Championships are just around the corner on March 9-10 in Pittsburg, Kansas. Adams State kept its spot atop the country following competition at both the Adams State University NCAA Qualifier and the 2019 Husky Classic. Top performances from the weekend belonged to Ian Kerr (now tops in the nation in the 200), Samuel Reid (fourth in the shot put), Kale Adams (seventh in the 3000) and Dalton Graham (seventh in the 5000). It is the first time that Adams State has held the No. 1 spot for consecutive weeks since the Week 6 and 7 rankings of the 2016 season. The Grizzlies also opened the year in the top spot. Also staying put was No. 2 Ashland. The Eagles were split between the the Kent State Doug Raymond Invite and the GVSU Big Meet and posted some of the best times in the nation in their respective events, led by Brent Fairbanks (leads the country in the weight throw), Trevor Bassitt (second overall in the 200) and Nick Zak (third in the weight throw). Moving up one spot to No. 3 was Grand Valley State after hosting its GVSU Big Meet over the weekend. Top Laker athletes from the weekend were Dennis Mbuta (second overall in the 800), Zach Panning (third in the 3000) and Nick Salomon (eighth in the 800). The DMR squad also posted the third-best time ran so far this season. Dropping a single spot from No.3 to No. 4 was Tiffin. The Dragons spent the weekend hosting its Dragon Grand Prix. Tiffin was led at the meet by Nikolas Curtiss (third in the nation in the weight throw) and Lamar Hargrove (fifth in the 60). Advancing two spots to move back into the top-five was No. 5 Central Missouri. Top performers for the Mules at the 2019 Bearcat Invite were Nathan Cummings (now second in the country in the shot put) and Brad Jenkins (fourth in the triple jump). The group’s 4×400 team also posted the eighth-best time in the event so far this season. The rest of the top-10 was rounded out by No. 6 Colorado Mines, No. 7 Findlay, No. 8 West Texas A&M, No. 9 Academy of Art and No. 10 Northwood. The biggest improvement in the poll was seen by No. 19 Azusa Pacific who shot up 34 spots from the previous rankings. Four new teams entered the ratings after being previously unranked, led by No. 84 Lubbock Christian. For the first time this season Adams State has moved into the top spot in the country. This is the first time since 2014 that the Grizzlies have been ranked No. 1 in the TFRI. Adams State had athletes going at both its Adams State University NCAA Qualifier and the 2019 Husky Classic over the weekend. The Grizzlies saw great performances across all disciplines and were led by Kandace Thomas (now tops in the nation in the 60 and fifth in the long jump), Roisin Flanagan (second in the 3000), Eilish Flanagan (second in the 5000), Malena Grover (sixth in the 5000), Tiffany Christensen (seventh in the 3000) and Dianna Johnson (seventh in the 200). Falling one spot to No. 2 was Grand Valley State after hosting its GVSU Big Meet. It snaps a streak that saw the program ranked as the top team in the country for the first four indexes of the season. The Lakers got standout performances this weekend from Ellianne Kimes (currently second overall in the pole vault), Allie Ludge (fifth in the 800) and Angelica Floyd (fifth in the 60) among others. The DMR squad also posted the top time in the country so far this season. In total, the Lakers had 20 new marks get added to the rating index from the meet. Climbing one spot to No. 3 was Lincoln (Mo.). The Tigers spent the weekend at the 2018 Bearcat Invite. The group was led by Rene Medley (third in the 60) and Diana Caudwell (third in the triple jump). Switching spots with them was No. 4 SF State. The Gators were also at the GVSU Big Meet and saw top performances from Monisha Lewis (now leads the country in the 60H) and Alexis Henry (seventh in the 400). The 4×400 team also ran the best time in the nation. Rounding out the the top-five was No. 5 UC-Colorado Springs. It was a one-spot improvement from the previous edition of the ratings. The Mountain Lions were hosting its Colorado Running Company Mountain Lion Open this past weekend. The top athlete at the meet was Kayla Zink who posted the seventh-best time in the 60. The group’s DMR squad also posted the fifth-best mark in the country. Lewis, Missouri Southern, West Texas A&M, Ashland and Simon Fraser completed the rest of the top-10. The largest jump in the ranks went to Cal State Stanislaus who improved 29 spots from No 106 to No. 77. The biggest improvement in the top-30 belonged to CSU-Pueblo who advanced 24 spots. Four previously unranked teams entered the rating this week, with the highest rated being No. 61 Western Oregon. MEN | WOMEN Mar. 9-10: NCAA DII Championships, Pittsburg, Kan.